Since I started looking into all this I've came across quite a few interesting maps. I thought I'd share some here. This first one is a Flat Earth style map from 1715. I don't think the cartographer (Louis Renard) intended to portray the earth as flat, I think it's more a stylistic choice. The world is held up by Hercules, not Atlas. It's said that Hercules held up the world for Atlas while he went to steal the 'Apples of Hesperides'. 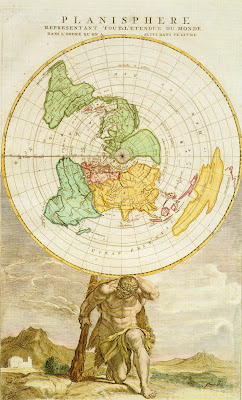 The following map was created by Johannes Ruysch and again shows a disc-shaped earth. Once again though I don't think it was the intention of the mapmaker to convey the idea that the earth is flat. I think this is my favourite though. It's by the cartographer Oronce Finé (1494-1555) and shows a heart-shaped world. The southern, at that time undiscovered, Antarctic/Australian continent is depicted as suitably big. Very intreesting. Greetings from Sweden...!